if you've read my blog for any period of time, you would know that my man and I are fans of california - particularly san diego. every summer, we spend about a week enjoying the beach, the weather on our beach cruisers, our favorite restaurants in la jolla and sunsets at sunset beach in point loma (behold - our engagement photos). is my hair unnaturally (and hideously) yellow in these pictures? why, yes. yes, it is. the time has come to announce that come the middle/end of may, we will officially be residents of san diego! david has been offered a great job there in downtown and my company is allowing me to transfer there as well. woot! we're both so grateful to have jobs in this economy . . . but a great job in san diego? land of 70 degrees nearly year round. land of 6 farmer's markets on saturdays within 10 miles of me. land of fantastic seafood. land of beaches and balboa park and outdoor events aplenty? I am grate. ful. tomorrow morning I am hopping on a plane to meet david there so we can look for a place to live. here's where you all come in (if you can). do I have any readers in the san diego area? we need a 2 bedroom place in downtown (I'm loving little italy), mission bay, fashion valley or point loma. anywhere north or east of that is going to be too far and we have some areas that we know we don't want to live. we've already looked for hours and hours on craigslist and have about 25 condos we're going to be viewing, but if you know of a smoking deal we can't pass up checking out - please let me know at bryantmilestones@gmail.com! wish us luck! Wow! Jealous! I love San Diego! My hubby and I fly there every fall! Enjoy! I'm completely and utterly jealous! That's so exciting though! PS. I like the yellow hair. I am so excited for you guys!!! You can beat California. I don't know anyone who lives there who doesn't like it. Come up and visit us in LA! Woohoo! 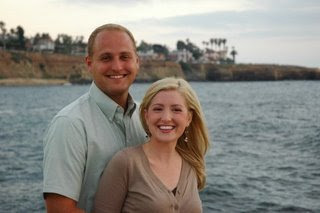 My family and I are currently residing in San Diego and loving every moment! Welcome to the city of beautiful weather, fantastic produce, and an abundance of culture! Congratulations to both of you! Please, keep us posted about your adventures with everything - moving/adjusting/enjoying your new heaven. Excited to have a relative over here. We would love to have you over to the burbs on one of your house hunting trips or when you get settled. Don't know many deals down in the city, but in a couple of years when you make the move to the North County, which you will, we will hook you up. Damn you. I miss the eternal sunshine of Southern California. And I miss In-N-Out. Number 3, animal style with a diet coke. Oh, and extra spread for the fries. Hooray! Talk about your dream come true for you Liz! My latest memory of San Diego is eating so much at a mexican restaurant they had to bring in the Oompa Loompas roll me out. SO so good! I have a friend in Newport, but that's probably too far north to help. Good luck with everything! Congrats to both of you! Your love for San Diego equals our love for Newport, but you guys are the lucky ones that actually get to move there! Oh my gosh, I'm seriously seriously jealous. Congrats and best of luck finding a perfect little home! Um, wow, your dreams are coming to fruition. I, too, and slightly chartreuse with envy. Because I luv downtown S.D. Oh the restaurants. Shopping. Water. Symphony Hall. Balboa Park. Character. Museums. And finding housing there now shouldn't be too bad--good timing with this crappy housing market and all. Buena suerte! I have a client who lives in San Diego in the Mission Bay area and loves it. I love the nightly walks at the Bay! completely jealous! I grew up in So Cal, and miss it terribly. I lived in SD after college in PB (with all the pot smokers). One day the cops came and took our neighbors away for growing pot in our apartment courtyard. It was a nice place to live if you don't mind the smell of pot. ;) I think they've cleaned it up since then. I just posted about a trail and nice park I discovered on my layover there this past weekend. SD is the most peaceful place I've ever lived (besides Hawaii). And no it's not because I was smoking pot... never tried the stuff. Congrats on landing such a wonderful city! We adore San Diego! Make sure to check out Sammy's Pizza in the Gaslamp Quarter! Congrats! Oh, how I love that city. Next Monday will be eight years since I was married in that temple. Hey...it's your roommate from Boston! Joel and I are back in Boston now but are ALSO moving to San Diego this summer. We're hoping to live downtown near his office but will know more after our apartment hunting trip in May. We'll have to get together! So fun Liz! That's really exciting. And congratulations on the new baby too! I'm so happy for you. Hi sweetie...I don't know you, but I came to love you through the accident crisis. Your life is just beginning now...SO much JOY ahead. Moving to the city that you love...starting a family of your own. You are every bit the lovely lady that your Mommy is and you deserve the best in life. I just found your blog today -- but I live in San Diego - yay. I can tell you that the ward (saw you were LDS) for Little Italy is in my stake and is great. Sigh, I don't know about life east of the 8 - but I've heard good things. And I can't wait until my husband graduates law school, so we can move up and up! For now though, yeah for being poor students and living it up in a 1B with some crazy neighbors.